The Self-Absorbing Man: It's a Girl! 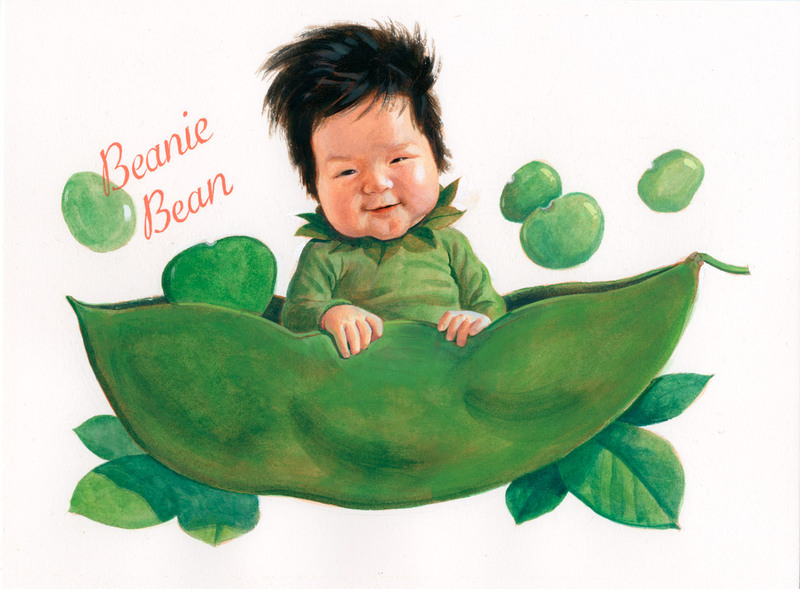 Beanie Bean. 2012. Gouache and acrylic on paper, 12 × 9″. All right, so she's not my girl, but "Beanie" is my girlfriend's new niece and she is "nuclear cute." I finally got to meet her in Atlanta this past weekend. It's been quite some time since I held a baby (they're heavy). With a terrifying grip, ample cheeks and hair, I just had to paint her for Mother's Day. What a gorgeous painting! Sounds like you had a good time. Thanks! Yep, it was a quick weekend trip, but tons of fun. Niiiice illustration. Is she a superheroin I don´t know? Throws beans at superhuman speed? Well, I don´t want to bother you, but I´ve always asked me a question about your art. I have done 4 painted books for "certain" comics company and I´m pretty tired of paint every milimeter of every page. Did you went from oils to pen and ink (and acrylics-gouache)tired by the effort, or was it the sales, or the amount of time consumed, or the smell of turpentine? Maybe the answer is somewhere in the blog, but I must admit I have read only 85% of it... Thanks. Luis, it was all of those things. I actually recommend not painting comics to most people who ask me for advice. I stopped painting in oil in 2006 because of the turpentine, but I stopped painting altogether in 2008 because it just took too much time. The ultimate decision is with you, because it's all the same to a publisher. It's your time, not theirs. Thank you for the advice, Paolo. I guess you are right. At least you didn´t reach that conclusion on your sixties, like Corben, who recently said that comics should be just black ink and the white of the paper, after forty years of painted pages (but what pages!). Anyway your Sabretooth paintings, with its warms and cools, are some of my favorite comic illustrations ever -not a waste of time! It's definitely worth it in the artistic sense, it's just not a good way to make a living. Still glad Corben did it. I think it's something that can be balanced. I'm actually reading Akira right now, and I love the painted introductions, short as they may be. True, but I don´t think the american reader would accept a bunch of color pages here and there and then black and white. I found really interesting. I even like when in a manga one does the characters and another the background in a totally different style. Strange, but works. Anyway you still got the covers to do your painted thing. If you want to go back to oils without turpentine and with faster drying time, I recommend Galkyd. Check the wonderful paintings of Ashley Wood to see what it does. I've tried alkyds before. When I painted in oils, I always had to use Liquin as a medium, just for speed's sake. And yes, it's hard not to be a fan of Wood. Ah, but that's exactly what Galkyd is! Instead of linseed oil, the pigment is bonded with the equivalent of Liquin. I use to do the exact same thing, starting with acrylics and finishing with alkyds and oils. But you're right—don't get me started. I can talk shop all day! Sounds like alkyd, possibly has alkyd resin in it, but is really different from Liquin. I know Liquin, I have one bottle near me and two dried bottles around... I´ve done some paintings just for fun building two or three layers of oils with Galkyd and in the end looks like impasto but it doesn´t have that much paint. You just can´t do that with Liquin. As I said before, you can see this effect in the paintings Wood has done in the last 3 or 4 years. Good night -and don´t answer me!! !